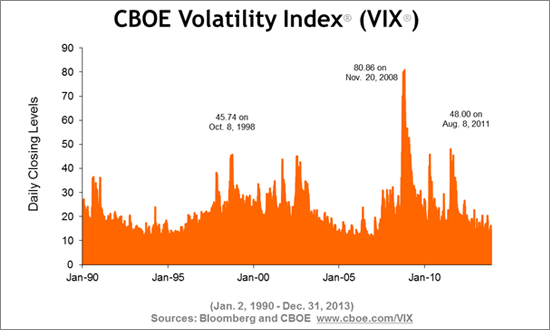 It's been a while since we talked about the CBOE's volatility index, the VIX. You might have also heard it referred to as the "fear index". It's value is derived from the market's "expectations of near-term volatility conveyed by S&P 500 stock index option prices". In other words, when the CBOE formula detects fear in the option market, it impact the value of the VIX. 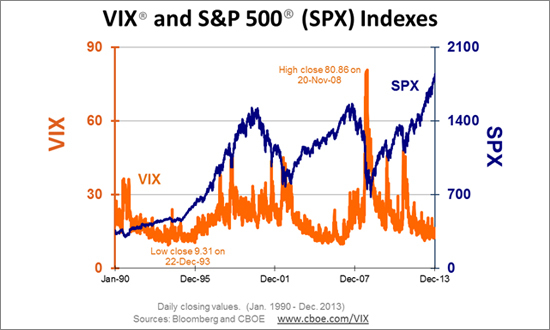 The VIX is currently trading at a relatively low level compared to historical norms. The index follows an erratic path, but the average is considered to be near 20. With a reading in the 16.50 area, we are currently within 3 or 4 points of the all time low and in a position in which historical cycles suggest the odds are in favor of a sharp spike in fear (VIX rally). Naturally, if this occurs, it would lead to higher Treasuries and lower stocks. In previous newsletters we commented on the similarities between today's market and 2011, just before the stock market panic. During that time the VIX rallied from the mid-teens to about 50! We aren't necessarily expecting that type of chaos, but we think a VIX reading of 30 is a reasonable probability. As always, we warn that you don't blindly bet the farm based on this conclusion, there is timing, luck, and of course accuracy factors involved. Usually, we are counter-trend traders (and thinkers). I rarely have the itch to be a bull in a market that is relatively high. In addition, I'm rarely looking for a black swan, or some sort of aberration of the norm. Nonetheless, the current environment seems to be highly susceptible to something out of the ordinary occurring. Thus, we've decided that for the time being we will forgo acting, or even reacting, to bearish signals in Treasuries (whether they be technical or fundamental). We'd much rather miss bearish opportunities, than get caught on the wrong side of a runaway train. As tempting as it is to turn bearish with the ZB at trend-line resistance (which is what we would normally do), we'll refrain from doing so. If you absolutely must play the downside, make sure you do it with limited, or at least hedged risk. If you were trading in 2011, you might recall the 30-year bond contract moving up 2 to 4 handles in a single trading day (on back to back days). We are overdue for that type of craziness. On the other hand, getting overly bullish with the market against technical barriers is a fools game. Perhaps a simple strategy of buying cheap calls in the ZB and ZN will get you in the game without opening the door to misery if we are wrong. **Consensus:** We are surprised Treasuries haven't reacted more to the stock slump, still seeking 135'04 as the first target in the ZB. For approximately two years, the e-mini S&P has held its 100 day moving average. Each attempt to break it (aside from the temporary lapse earlier this year) and roll into bear market territory, has been met with buying. However, we all know that patterns work until they don't...and this pattern seems to have gotten mature, and quite frankly too popular. Investors have been trained to buy at the 100 day moving average, but if this method ever fails the complacency will turn into panic. We aren't sure if this is the "big one" or not, but similar to our pledge to avoid technical sell signals in the ZB, we are avoiding buy signals in the ES (at least for now). We learned that lesson the hard way during the flash crash. "Buy the dip" strategies worked well, until they didn't...and on that single day in May of 2010 most of the money made with those strategies was wiped out in a single swoop. We've said it before, and we'll say it again; we would rather be on the sidelines wishing we were in, than in the market wishing we were on the sidelines. **Consensus:** The ES is melting through support levels with little difficulty. As ugly as this has been, it is the tip of the ice-berg relative to its potential. We aren't saying this is definitely the "big one", but it isn't worth getting aggressively bullish using technical buy signals on the off chance that it is. If you want to be long, we don't blame you but do it with protection and hedges. The risk of a fall-out is real. January 15 - Go long the CAD (eMicros are preferable for most to allow for scale trading and lasting power with little margin/risk). 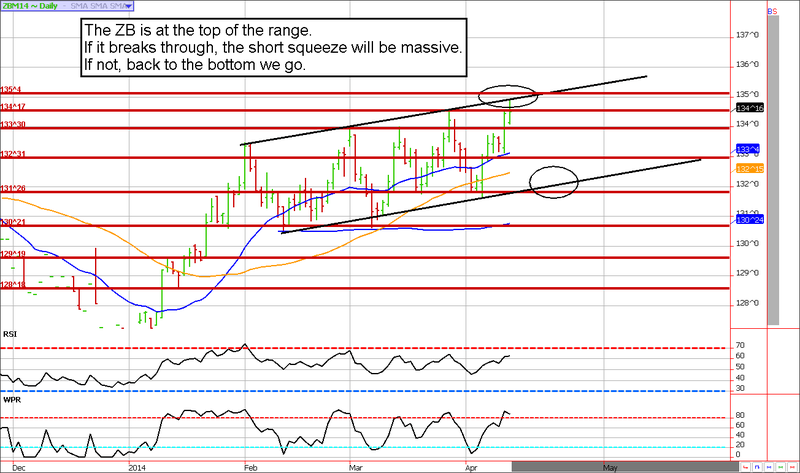 January 30 - Nibble on more Canadian dollar micro contracts to average our entry price to a lower level. Feb 14 - Sell E-micro CAD add-ons to lock in $170 to $200 per contract before transaction costs. February 28 - Sell April ES 1900 calls for about $11.00. March 13 - Roll all e-micro CD futures into the June contract. We need more time. March 13 - Sell May Euro 143 calls near 30 ticks ($375). March 20 - Buy back May Euro 143 call near 9 ticks to lock in a quick profit of anywhere from $250 to $275 per contract before transaction costs. March 20 - Add to e-micro CAD trades (double the quantity for most). This lowers our average entry price. March 21 - Sell June crude oil 107/91 strangles for about $1.00 in premium, or $1,000. This is the max profit before transaction costs. March 24 - Buy back April ES 1900 calls to lock in again (roughly $350 before commissions and fees per contract). April 3 - Exit all add-on contracts in the CAD e-micro scale trade. Most clients should be up about $200 per contract before transaction costs. 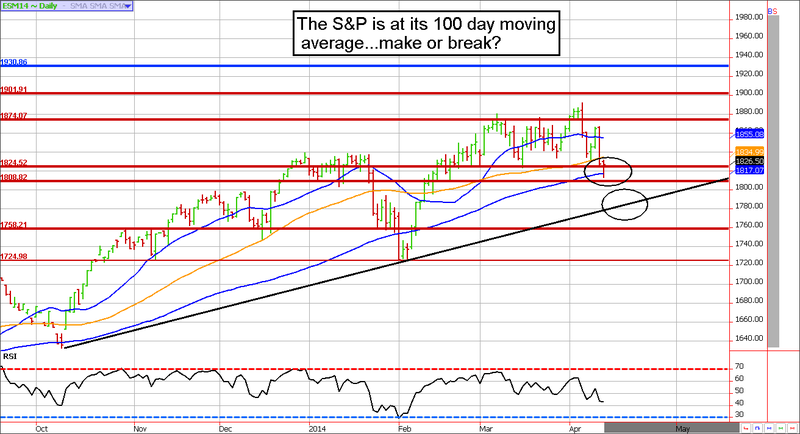 April 4 - Sell May S&P 1930 calls for about $11 ($500). April 4 - Buy back the May S&P 1930 calls for about $4.5 to lock in a (very) quick profit of about $300 to $325 per contact.